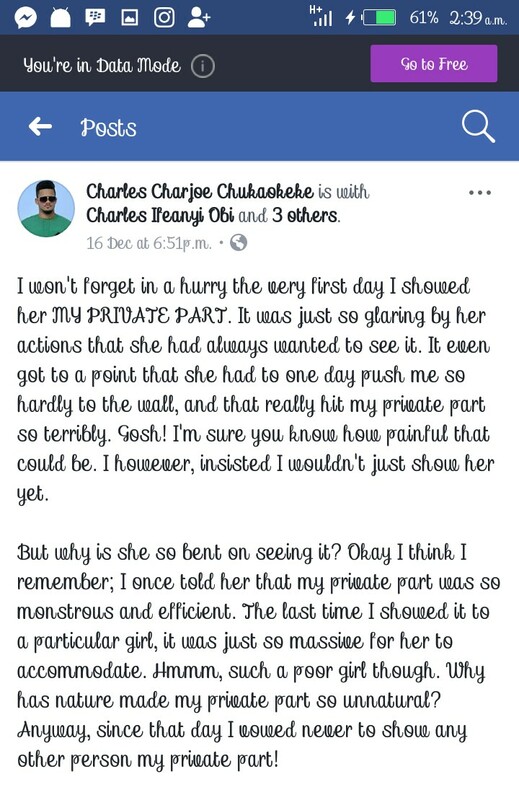 A Facebook user reveals why he does not like showing ladies his private part. 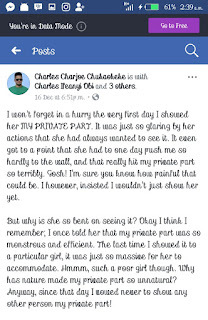 This is why a Facebook user, Charles Charjoe Chukaokeke, vowed never to show his private part one. I won't forget in a hurry the very first day I showed her MY PRIVATE PART. It was just so glaring by her actions that she had always wanted to see it. It even got to a point that she had to one day push me so hardly to the wall, and that really hit my private part so terribly. Gosh! I'm sure you know how painful that could be. I however, insisted I wouldn't just show her yet. But why is she so bent on seeing it? Okay I think I remember; I once told her that my private part was so monstrous and efficient. The last time I showed it to a particular girl, it was just so massive for her to accommodate. Hmmm, such a poor girl though. Why has nature made my private part so unnatural? Anyway, since that day I vowed never to show any other person my private part! One night, she walked into my room while I was half asleep. She was unusually half dressed. Yet again she repeated the same action, and my private part got uncontrollably aroused. I couldn't help but pounce on her like a wounded lion. She was subsequently left gasping for breath on the bed as I walked away. That is the reason why I try as much not to show off my anger which is that private part of mine. If only she knew how my private part felt, then she'd never attempt arousing my anger!